In the second game of my preparation for Australian Masters 2017 I played against Eastern Barbarian, my usual sparring partner over Universal Battle. We have not played against each other for quite a long time too so it was a good opportunity to catch up. I asked EB which army he would like to play and he picked Adam's Undead. I was really intrigued about this all cavalry Undead force as it was very unique and I have never played against this type of Undead army before. It is a very intriguing combination of abilities that I would need to deal with as an opponent. 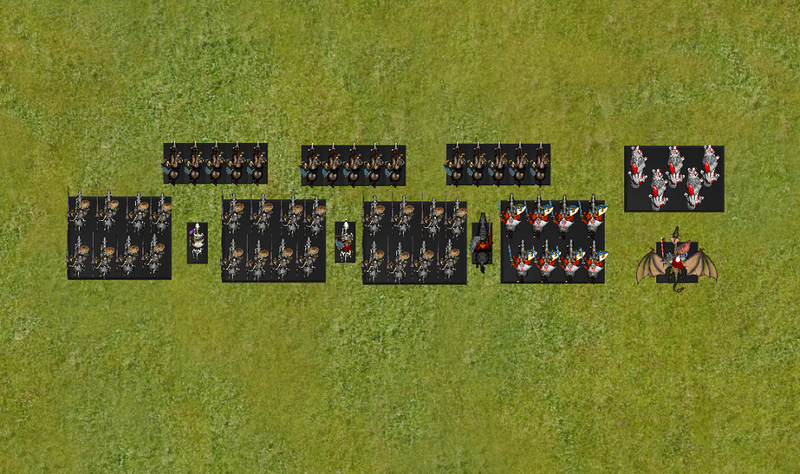 On one hand, only my own cavalry and fliers would match the charge range of entire Undead army. On the other, majority of it Shamble so may not be able to advance to good charging positions as quickly. However, Speed 8 with Surge is actually very good indeed and it will be difficult for me to predict where the enemy units may actually go next. Another interesting thing was that while units like Werewolves and in particular Soul Reaver Cavalry have very good Melee characteristic, then the rest of the army hits on 4+ to start with. It means that any hindered charges are far less efficient than usual. And in the case of cavalry, unless Bane Chant is in effect, there is no bonus for lances. 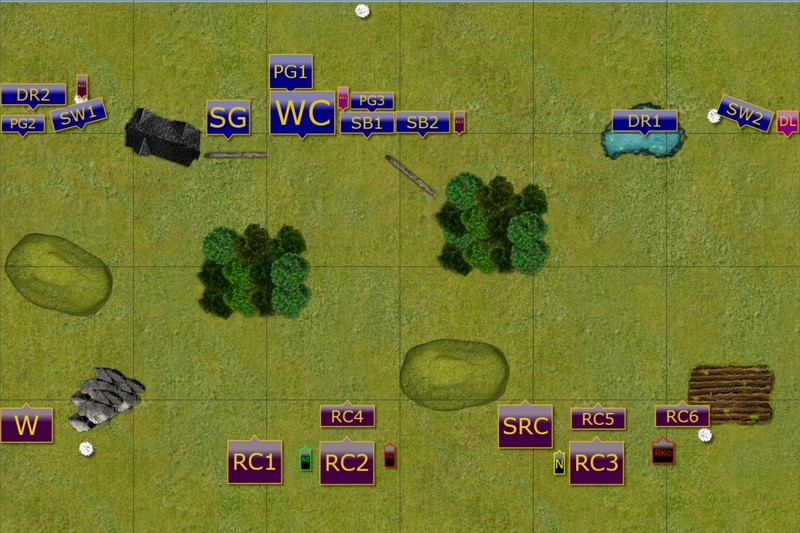 Deployment of the armies and positioning of the tokens. We rolled Pillage as a scenario this time and got 5 tokens. I got lucky to have 3 tokens to place and to win the roll off to choose North as my deployment zone. 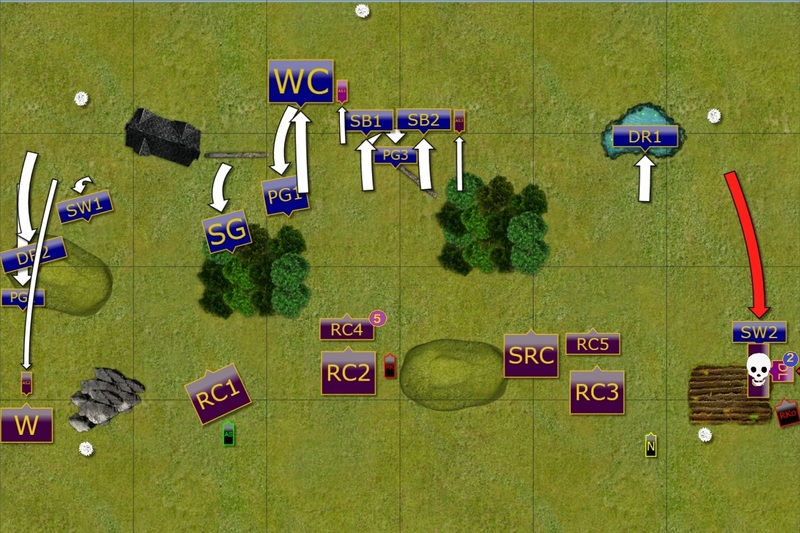 The idea was to engage on the flanks to slow down the advance, hold the center and keep fast units alive long enough to claim or to at least contest the objectives. I got to choose who begins and decided to go first and try to inflict some damage with ranged attacks. Elves advanced across entire battle field and units moved to positions to start shooting at the enemy. 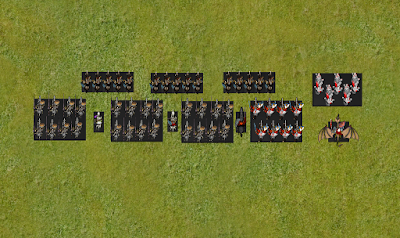 All the units with bows aimed at the middle revenant cavalry but while the damage was significant it was not yet enough to destroy the unit. At the same time the Drakon Lord landed on the flank of the enemy formation, naively thinking he found a safe spot to do so. Undead units moved forward towards their living enemies. Only on the right flank the direction of the advance was changed and on the order of the Revenant King, the undead knights, supported by dark magic, charged the very surprised Drakon Lord. Only the fact that the charge led through a difficult terrain saved him - for now. Elves withdrew the center while infantry regiments approached the defensive positions inside the forests. This movement resulted in the inefficient shooting though. At the same time, Elves also had to commit on the flanks. 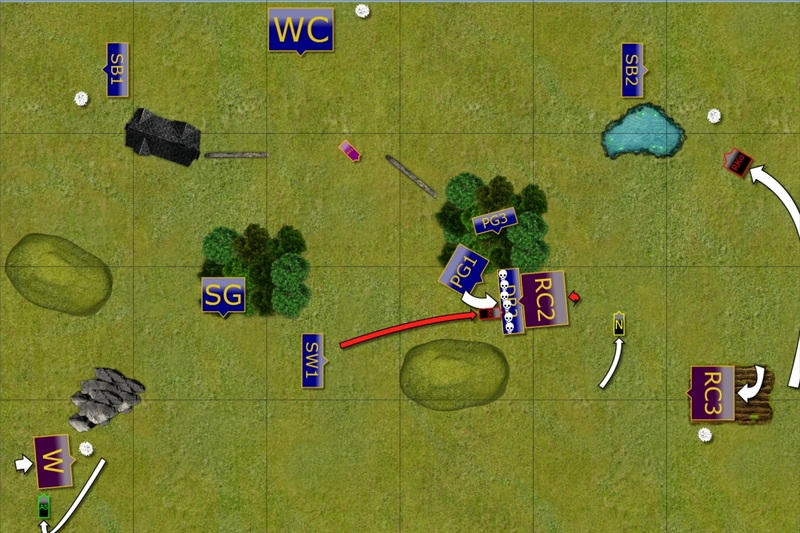 On the left the Army Standard sped forward to distract the Werewolves, while on the right Storm Wind counter attacked and helped the Drakon Lord. Now they had to face the Revenant King himself. Werewolves seemed to take the bait but instead of moving forward, they grabbed the Elven banner and withdrew. In the center, two units of the cavalry charged Sea Guard but thanks to the protection of the forest the Elven marines survived the charge. On the right the cavalry regiment was once again surged into the fight against Elven Storm Wind while the King attacked the Drakon Lord. 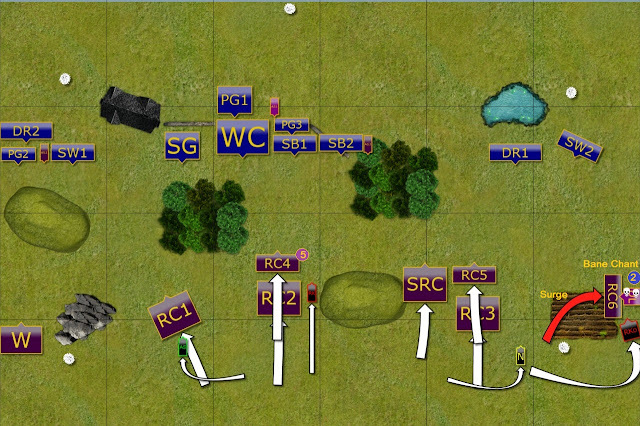 All units where now locked in melee. The battle entered the point were melees were erupting across entire battle field and it was clear that whoever would get an upper hand now may be closer to the overall victory later. Palace Guard on the left charged Werewolves alone as it was clear Drakon Riders would not be able to help. 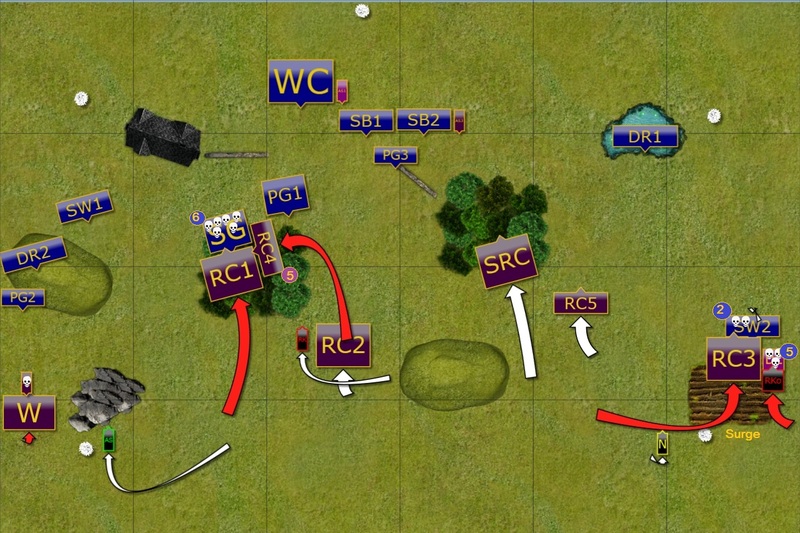 However, that attack would by time for the other units to move towards the center. The forest witnessed some more vicious fighting and this time Elves managed to get rid of both enemy cavalry units. 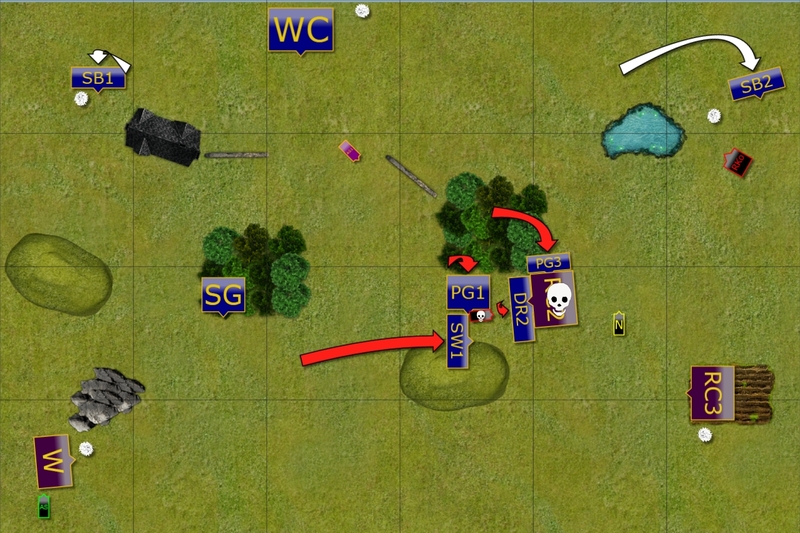 In the second forest the brave army standard decided to slow down the Vampires all by himself. Last but not least, the units on the right flank also exchanged blows with their enemies but even the Drakon Riders were not able to rout their enemies. Undead abandon the left flank. Due to heavy losses on the left flank, only the Werewolves remained there and guarded the objective. The rest of the units engaged with their enemies and one regiment of the cavalry was called back to support center or flank attack. 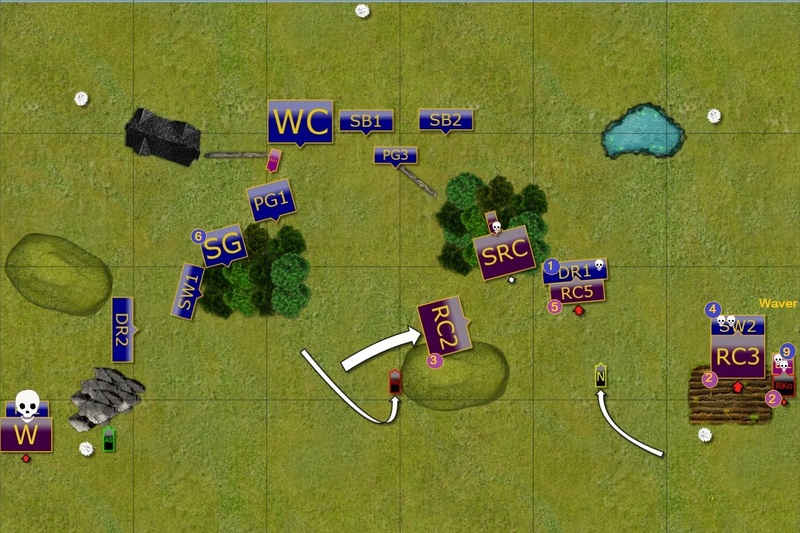 Elven units that were free to moved continued the outflanking maneuver. Drakon Riders may have been a bit more enthusiastic about it as they landed very close to the mounted Revenant King. At the same time, the Palace Guard tried to stop the Vampires while second unit of the Drakon Riders routed their adversaries. 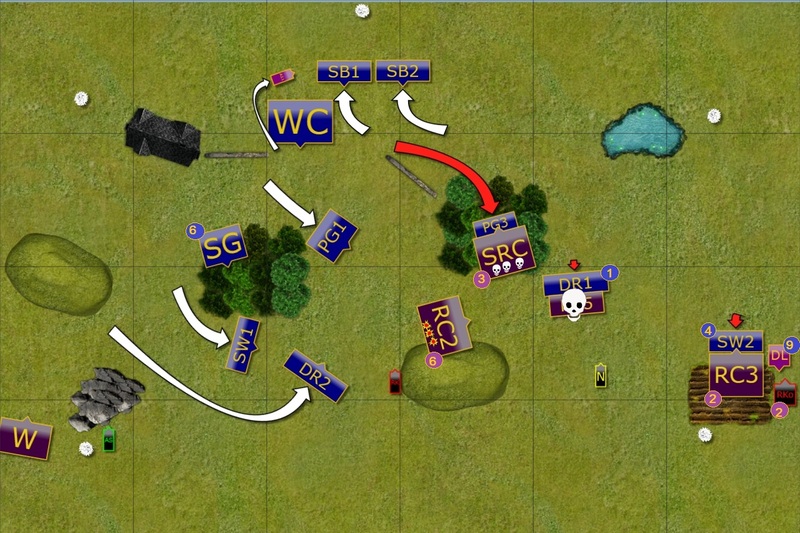 Undead forces win on the right flank. 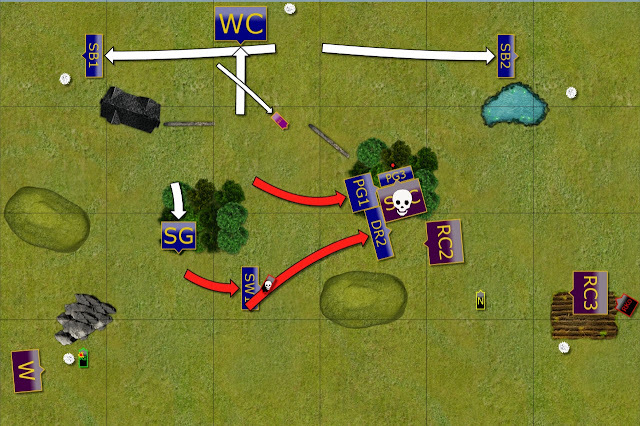 Remaining Undead units had to hit hard and fast to be able to redress the battle line and face incoming Elven units. On the right flank Revenant King and cavalry finally got rid of the Drakon Lord and Storm Wind knights. Another Revenant Cavalry routed the Drakon Riders and reformed to face the center. Unfortunately, the disaster struck as first Soul Reaver cavalry completely missed their attacks against Palace Guard and instead of routing them, they got stuck. To make things worse, the Revenant King failed to do any damage against Drakon Riders. They were now free to fly and attack anyone they wanted. Blunder in the attack cost Soul Reaver Cavalry dearly. Three Elven units attacked as one and even the mighty Vampires had to concede a defeat in this fight. That seemed to help Elves to secure their own deployment and fast units moved towards the objectives. 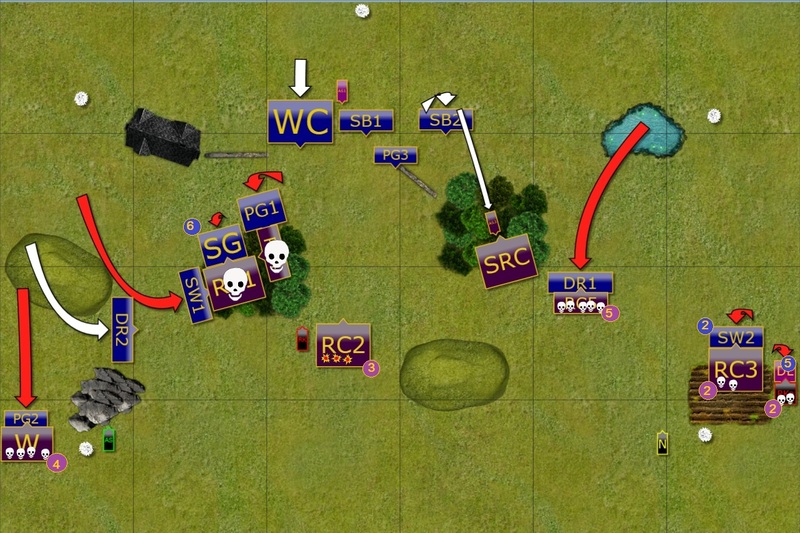 The situation was very interesting now because Undead forces had very few units left but they were positioned in strategic positions. Both Werewolves and Cavalry were guarding the objectives and seemed to be in a relatively safe positions. Second unit and the King charged Drakon Riders but despite heavy casualties they didn't yield. However, they could not fly and that meant they were not able to contest the objectives either. Finally, the Revenant King on his flying Wyrm flew towards another objective, threatening Silver Breeze cavalry trying to reach it too. Elven units charged out of the forest and both, Revenant Cavalry and the King were routed. There was little to stop these units now from attacking the last cavalry unit and to contest the objective. However, would there be time to do so? Undead Necromancer charged Drakon Riders all by himself while the King contested on of the objectives. 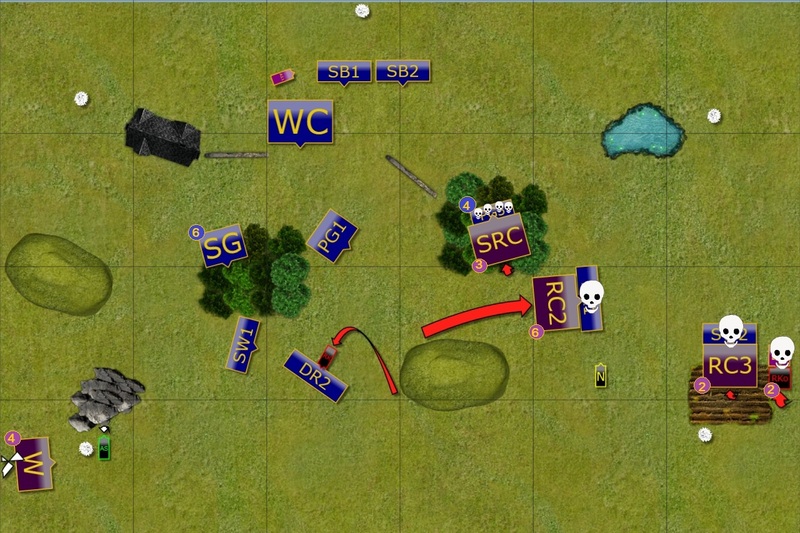 Although Elves routed more enemy units, the Undead managed to keep the strategic positions and both armies withdrew with neither of the generals claiming the victory. Many thanks to Eastern Barbarian for a great game! It was good to play against each other again and I appreaciate that he took time to play with the force he has never used before. He told me he really likes this army and if not for the fact he owns quite a few already, he would like to make one of his own. He even mentioned some ideas for modelling already! As to the game itself, yet another draw and yet another game where turn 7 may have changed to final outcome. It just shows I may need to be more decisive in my maneuvering. I definitely got lucky, in particular when Soul Reaver cavalry failed to rout Palace Guard and at the same time the mounted King did zero damage against the Drakon Riders. That helped me to tip the scales in my favor significantly and stop the Vampires from reaching the center of my lines. 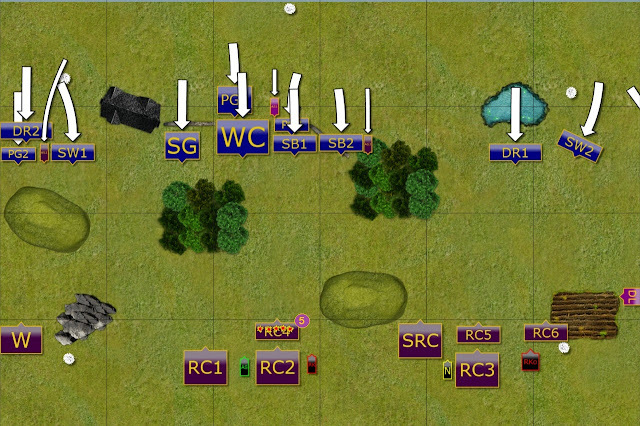 I was worried that I may run out of units to block them and to claim the objectives in my deployment zone. I obviously made a mistake with the Lord on the flank as I did not properly assess the range of surge with cavalry. Although terrain helped and I had the King on the Wyrm occupied for majority of the game, it was still a mistake. The fact that EB spread his forces probably helped me too. I have a feeling that if we played again he would have weighted one flank, probably the right and try to keep bottom corner tokens in his control while advancing towards the top right. I also noticed that while I had the plan to shoot at the enemy in the center and to try and engage on the flanks, I ended up reacting to the movements of my opponent and focused on exploiting the potential openings rather than creating ones. I think that is the reason why the game ended up in a draw.